Age restrictions: Children under 16 must be accompanied by an adult whilst on the tour.Infants 3-4 will be charged for transportation only as they will occupy a seat. Entry to Warner Bros. Studio Tour is Free for Children Under 4.Infants 2 years and under will need to be booked on the Golden Tours system although they are free of charge due to health & safety regulations. Opening hours: Monday - Saturday departs from King’s X St Pancras at 9:30am/11:30am (from 1st March 2019)/1:30pm. Entrance to Studio: 11:30am/1:30 pm (from 1st March 2019)/3:30pm. Depart from Studio: 4pm/6pm (from 1st March 2019)/8pm. Pick up point: Departure From: King’s Cross Station, Pancras Road, Bus Stop TTime: Meeting time at 9:15am and the coach will depart at 9:30am.Please take your confirmation/voucher along with photo ID and credit card used for purchase with you. Important info: Please turn up at least 15 minutes before departure time to allow for check in. 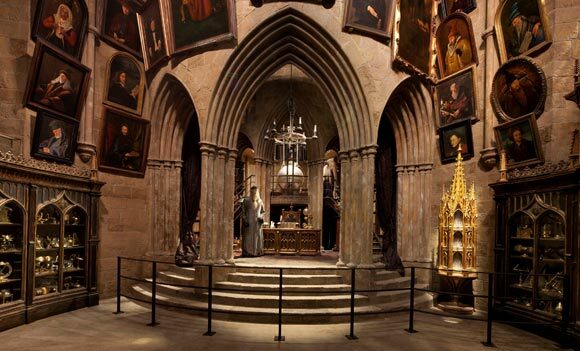 Tour at Warner Bros. Studios lasts 4 hours.Return transportation to Warner Bros. Studio Tour London on a Double Decker branded bus.Entrance ticket to Warner Bros. Studio Tour LondonGolden Tour reserves the right to cancel tours should there be an insufficient number of pax.